Pierre-Auguste Renoir. Ref: Renoir. (Self Portrait). Print sizes are approximate, and may include a white border around the print, which will vary in size depending upon the originals proportions. a square original may have a larger border top and bottom. 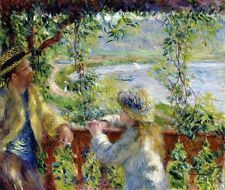 By Pierre-Auguste Renoir. Material:High Quality Giclee Art print, printed on a gallery-quality and durable canvas.Excellent reproduction of original. Caution: for technical reasons it is possible that the image looks discoloured. Landscape in Wargemont by Pierre-Auguste Renoir. Fine Art Giclee Reproduction on Canvas of the artists original work. Fine Art Giclee. Museum Quality Canvas Unstretched. Total Canvas Size 28.64" x 24". 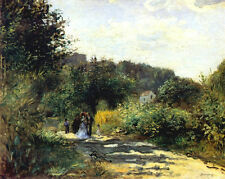 Landscape by Pierre-Auguste Renoir. Fine Art Giclee Reproduction on Canvas of the artists original work. Fine Art Giclee. Museum Quality Canvas Unstretched. Total Canvas Size 35.66" x 24". We use ‘archive quality’ inks and canvas that have been independently tested to resist any visible fading for over 100 years ! Fine Art Giclee Reproduction on Canvas of the artists original work. Fine Art Giclee. Museum Quality Canvas Unstretched. Total Canvas Size 28.69" x 24". We use ‘archive quality’ inks and canvas that have been independently tested to resist any visible fading for over 100 years ! Landscape at Cagnes by Pierre-Auguste Renoir. Fine Art Giclee Reproduction on Canvas of the artists original work. Fine Art Giclee. Museum Quality Canvas Unstretched. Total Canvas Size 27.3" x 24". We use ‘archive quality’ inks and canvas that have been independently tested to resist any visible fading for over 100 years ! THIS IS A GREAT QUALITY REPRODUCTION PRINT. No border on this print. IMAGE SIZE IS 11" X 14". Landscape in southern France by Pierre-Auguste Renoir. Fine Art Giclee Reproduction on Canvas of the artists original work. Fine Art Giclee. Museum Quality Canvas Unstretched. Total Canvas Size 20.55" x 24". Snowy landscape by Pierre-Auguste Renoir. Fine Art Giclee Reproduction on Canvas of the artists original work. Fine Art Giclee. Museum Quality Canvas Unstretched. Total Canvas Size 30.11" x 24". We use ‘archive quality’ inks and canvas that have been independently tested to resist any visible fading for over 100 years ! Cafe by Pierre-Auguste Renoir. Fine Art Giclee Reproduction on Canvas of the artists original work. Fine Art Giclee. Museum Quality Canvas Unstretched. Total Canvas Size 19" x 24". We use ‘archive quality’ inks and canvas that have been independently tested to resist any visible fading for over 100 years !